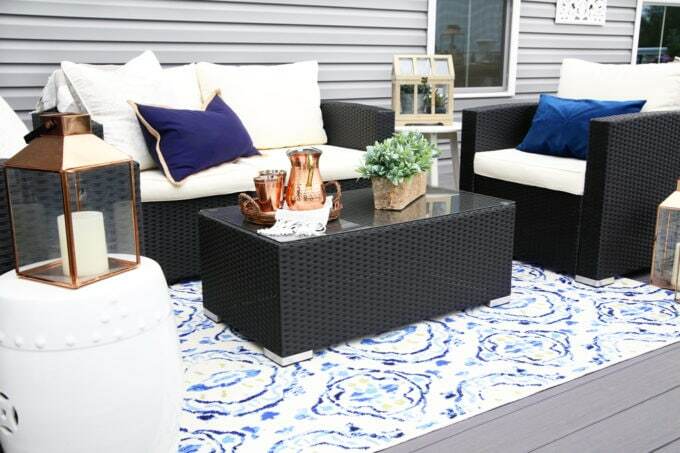 We love our new backyard deck because it is beautiful, super low maintenance, and made with high quality materials that will last for years and years to come! 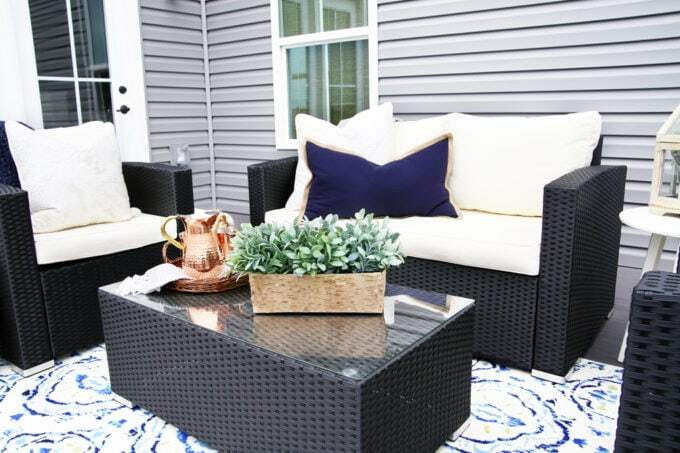 Come take the grand tour of our deck and enjoy the big reveal! A huge thanks to AZEK for providing product for this post! 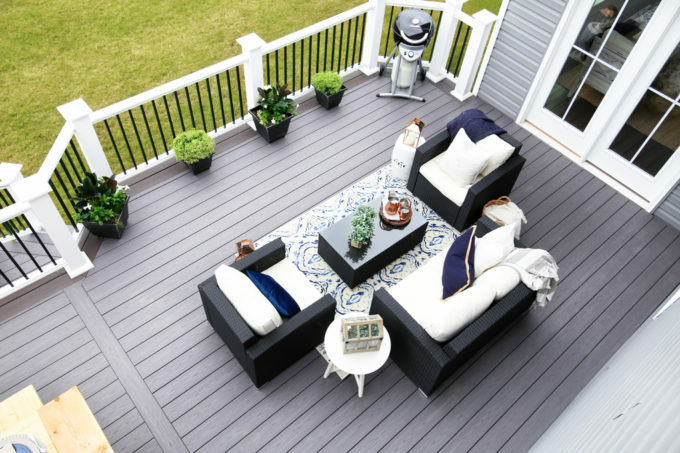 My favorable opinion of beautiful, high-quality decking is 100% my own. This post contains affiliate links. For more information, see my disclosures here. I grew up waaaaayyyy far out in a little tiny town that hardly anyone has heard of. Sure, sometimes we complained that it was kind of out there in the middle of nowhere, but really there was something so homey about a slower pace of life without endless traffic and a place small enough that you knew just about anybody. I was far from a city girl to say the least. Donnie, on the other hand, grew up in the middle of suburbia. He was used to having stores and restaurants and entertainment options nearby. He liked being close enough to the city that you could drive or ride the subway in any time you wanted to. And he liked that you could meet different people from different circles all the time and constantly widen your group of friends. 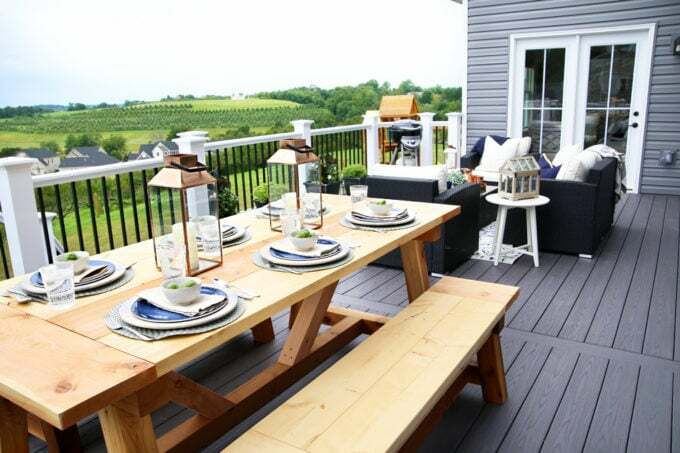 And this was the reason, from the moment we moved into our house, that I could not WAIT to put a big beautiful deck on the back– so we could really enjoy and make the most of our beautiful surroundings! Today is the day! 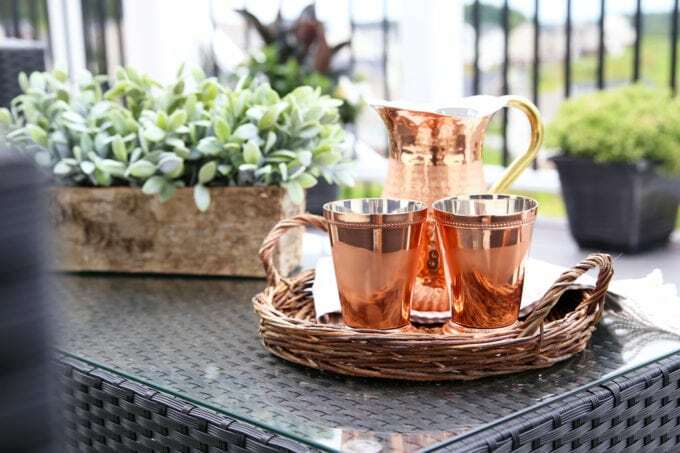 I am so incredibly excited to be able to share the final reveal of our deck project with you! 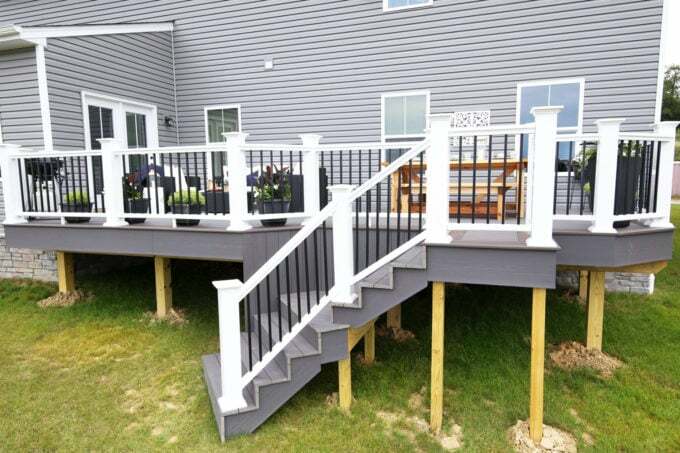 We were delighted to partner with AZEK on this project because literally every deck owner and installation professional we talked to told us that they were the very best in the business… and now we can see why for ourselves! I am so thrilled with how everything turned out and can’t wait to give you the grand tour! 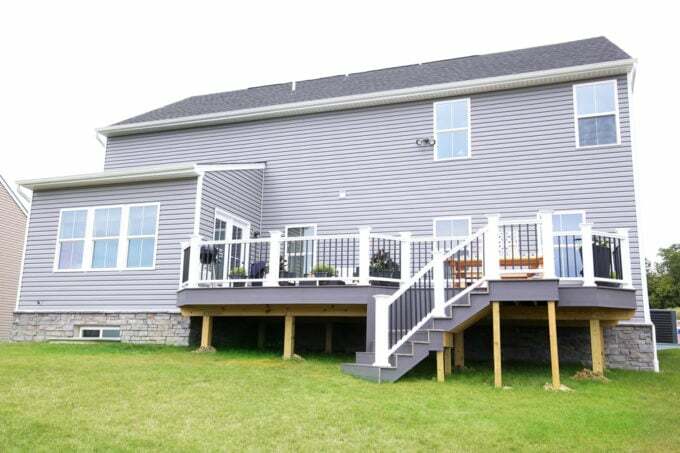 The deck is about 28′ long x 14′ deep, giving us plenty of room for grilling, eating, spending time with family and friends, and just relaxing! This furniture may look familiar… we actually had it in our sunroom until the deck was built, but I couldn’t wait to move it out here! I love how it contrasts with the Island Oak decking that we chose for the main part of the deck and also ties in nicely with the Dark Hickory border that is along the outside edge. I used almost all decor I already owned to decorate this seating area, other than the beautiful rug, which I ended up finding on super clearance– I love it when that happens! The other purchase we made on this side of the deck was the little grill that is just barely peeking into the shot above. We knew we wanted it to be on the part of the deck that was closer to the house so it would be easy to pop out and do some grilling, and that angled corner ended up being the perfect spot for it. Since we’re kind of in that transition period between summer and fall, I liked the idea of using the combination of blues and copper together because they work nicely with both seasons. 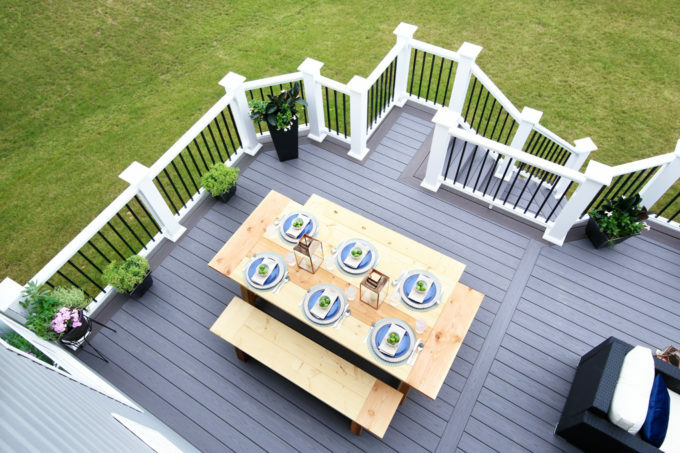 I am loving the white railings with the square black balusters as well. 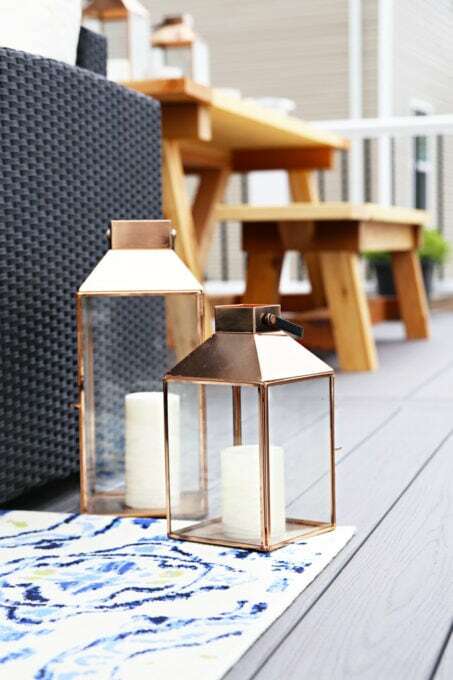 The AZEK posts are nice and solid and are more substantial than some of the other thinner rails we had seen when we were looking at different decking brands. 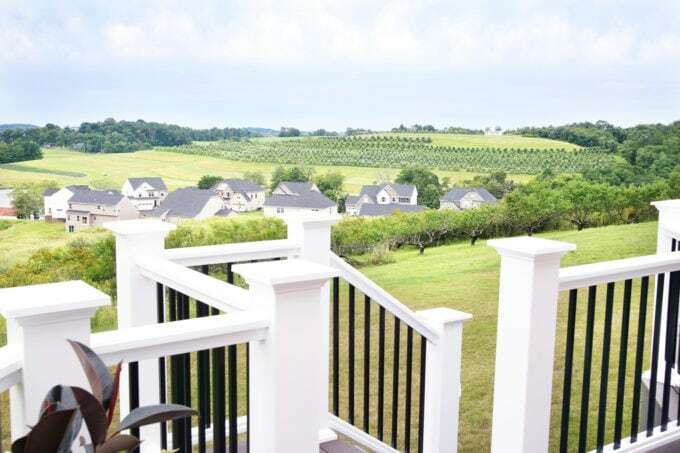 I initially thought I would go with all white railings + balusters just because I love white so much, but black balusters were definitely the right choice because they are much more “see through” and don’t impede the view as much. When Donnie saw the one I had chosen, he said, “I can make that!” and I am so impressed with his handiwork! I’ll have to see if I can get him to do a whole post on just the table and benches, but I thought he did an amazing job! 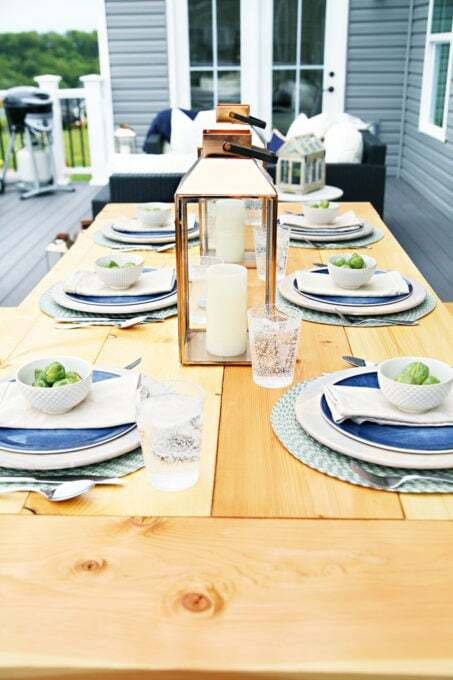 We have already eaten dinner out on the deck quite a few times, and it is the best space to enjoy a meal together as a family!! As I’ve shared our deck building process, I’ve had a few people ask what we plan to do with the space under and around the bottom of the deck. 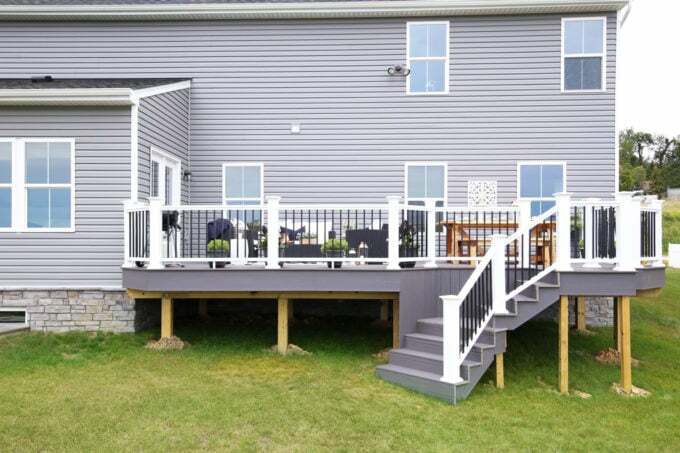 While we kind of want to live with the deck as is for a bit and see how we end up using it most, we have considered the idea of adding a small patio area around the bottom of the stairs where we could have a little fire pit and even more seating. We will probably add some landscaping elements next summer as well. Sometime down the road, the design of the deck is such that we could also add a roof or pergola over part of it if we would choose to do so. With the way the sun hits our house, the deck is shaded pretty early on in the evening, so we didn’t feel the need to add anything overhead right away. Right now, though, we’re enjoying our new space exactly the way it is! Thank you so much for taking the tour of our deck! I’ll also include a full source list below in case you’re wondering where anything came from! 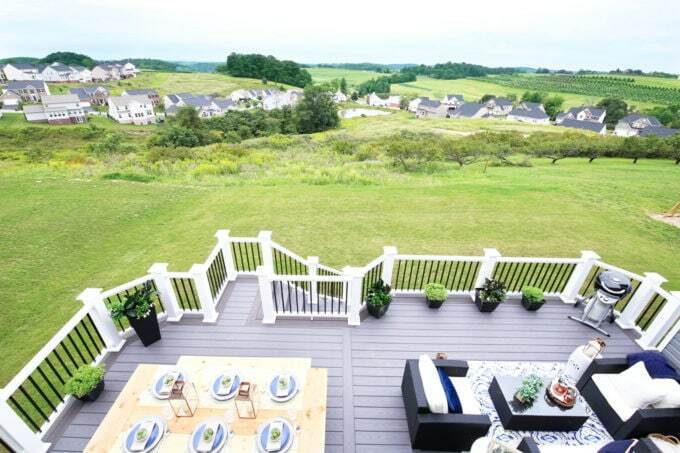 Your deck and view are gorgeous! I thought I was looking at a stock photo! You are so sweet, Emily! Thank you so much for your kind words! Hope you’re having a wonderful week! It’s truly beautiful, Abby! What a perfect time of year to enjoy it! Thank you so much, April! You are so sweet! We’ve really been enjoying it! It’s amazing! Some pics of your whole family having a meal would be fabulous. It doesn’t always need to look pristine perfect. People love the human effect! Aw thanks, Rachel! I was actually racing to get these pics done while the boys were at school before it started pouring down rain, lol! Hopefully we’ll be able to get some family shots out there sometime. I would love that too! Hope you’re having a wonderful week! Abby, it looks SO GOOD! You have such an amazing view, too! 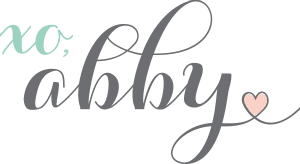 I love this blog and that you share your journey wit your home. We have a Palermo and I followed you all through our building process it was so helpful! Oh, Abby, this is stunning! You made great choices. I have a dream home floor plan that has an outdoor living area like this. I don’t know if it will ever be in God’s plan to have us move into that or any other home, but this is definitely something on my wish list should the Lord provide it!! I hope you enjoy many, many family gatherings here!! 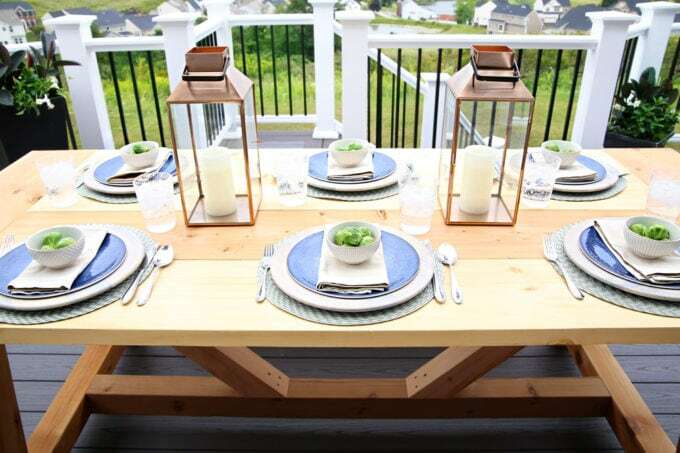 Beautiful and love the table set. Planned on building one of those, too, but ended up buying a set instead on clearance. I have hopes of still doing it but for inside! Yes! He’s planning to build one for the dining room, too! So excited! 🙂 Have a great week, Lisa! Ooo, yoga on the deck sounds like a great idea! 🙂 Thanks so much, Sal! Have a great weekend! Hi, Lucia! We actually got a storage box for the cushions, so they go in there and don’t get wet. It just hadn’t arrived yet when I took these photos. 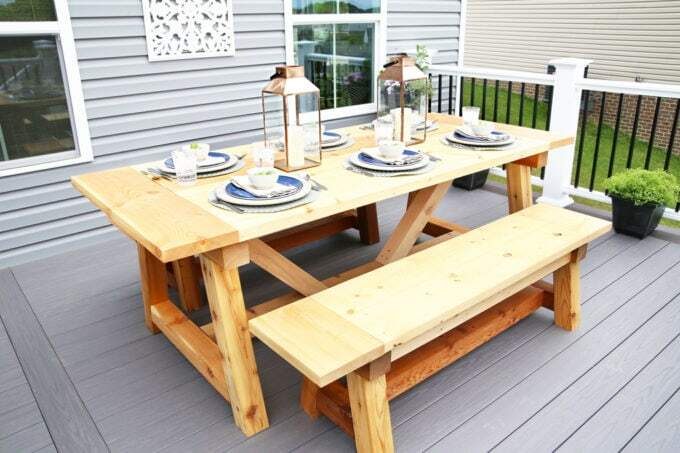 The table and conversation set sits out in all weather and is holding up well. 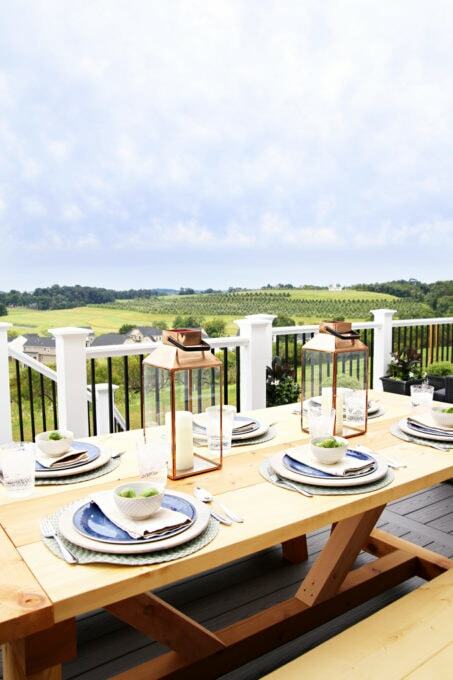 The conversation set is made to be outdoor furniture, and Donnie used a particular product on the table to make it able to stand up to rain, etc. (His tutorial is coming later this week!) We will cover it with a tarp in the winter. I hope this helps! This is beautiful! I’m in love with those black and white railings. So classic and elegant. Love your deck Abby. You have such a lovely view. 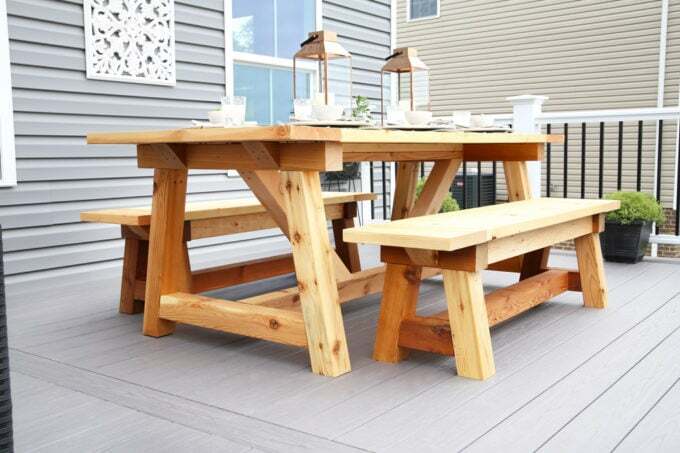 Your hubby did a great job making the table & bench. He really did! Thanks so much, Shirley! Hope you’re having a great Monday! Looks amazing! What happens to your furniture when it rains? Do you have to quickly bring all the cushions in? Hi, Joanna! We actually got a storage box for the cushions to keep them dry in bad weather. It just hadn’t arrived yet when I took these photos. The rest of the furniture sits out and has held up well! 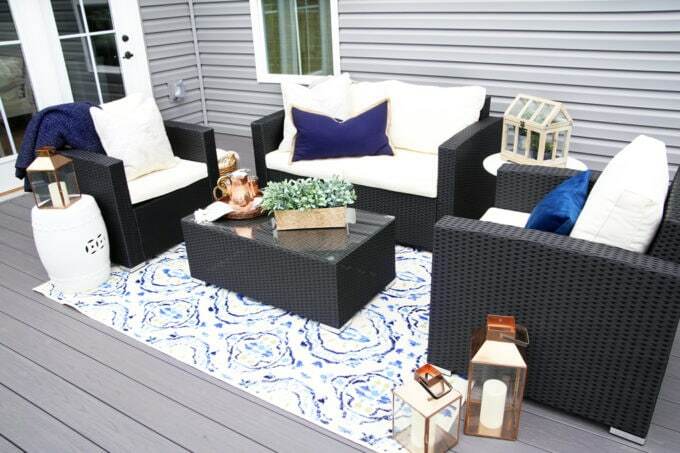 The deck looks beautiful and I love how you have decorated it with things you already had. The table Donnie is just great! I love the “chunkiness” of the legs and the geometric trussing of the legs. Great look! Enjoy! Aqua is just the best, isn’t it?!? 🙂 Thanks so much, Isabel! Hi Abby Looks really stunning. Hope you enjoy it! How does the furniture and carpet cope in and after the rain? No mold? Hi, Karyn! We actually pull the rug in and really just put it out when we’re having get togethers since the weather has become pretty rainy here in Pittsburgh this late in the season. We may leave it out more next summer during the less rainy part of the year. We have a storage box for the cushions (it hadn’t arrived yet when I took these photos), so it keeps the cushions dry in bad weather. The furniture itself sits out in all weather and has held up well. I hope this helps! Have a great week! Looks amazing, Abby! <3 By any chance, have you posted a house tour of some sort? Your house is huge! Hi, Karla! Our new home tour video will actually be on the blog tomorrow! Good timing! 🙂 Have a great day! 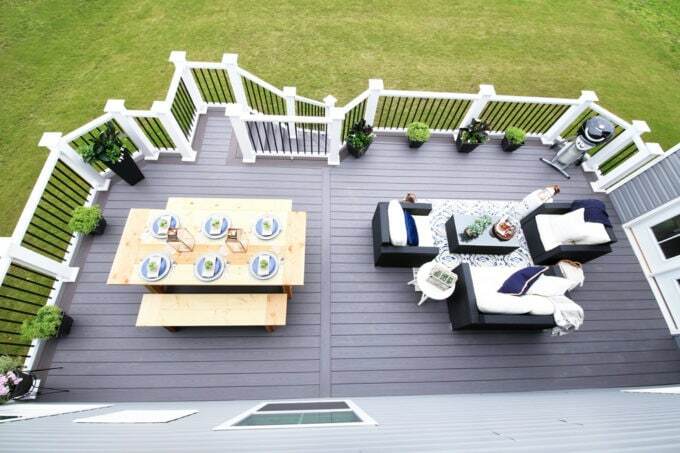 Your house was designed for a deck. Really finishes it off. The extra touch could be screened storage or a play area underneath! I agree, Kathy! We are loving it! And those are both awesome ideas! 🙂 Thank you and have an awesome day! Thanks so much, Sarina! We are loving it! 🙂 Happy Monday!! Wow Abby, that’s a stunning view right there. The place looks absolutely spectacular. Great job on the deck. Wow… Well done. (where’s the clapping emoticon when you need one lol). Aw, thanks so much, Joey! We are loving it! Have a great week! Beautiful!! I love the dining table and that you used a rug in the conversation area. You have beautiful style and a beautiful home! Thanks for sharing!